The Bride must kill her ex-boss and lover Bill who betrayed her at her wedding ceremony, shot her in the head and took away her unborn daughter. But first, she must make the other four members of the Deadly Viper Assassination Squad suffer. His best film so far. What i didn't like was that he made some changes in Vol.1 but that wasn't really necessary! He should make changes in Vol.2 because i found some scenes completely pointless. And also i prefer the two parts separate because they are so different each other! I liked Vol.1 much more than Vol.2. Yes, it's a bit confusing. However, it is more like a complete movie, so some people won't complain. But i still think they are better as two seperate films with different philosophy and style. 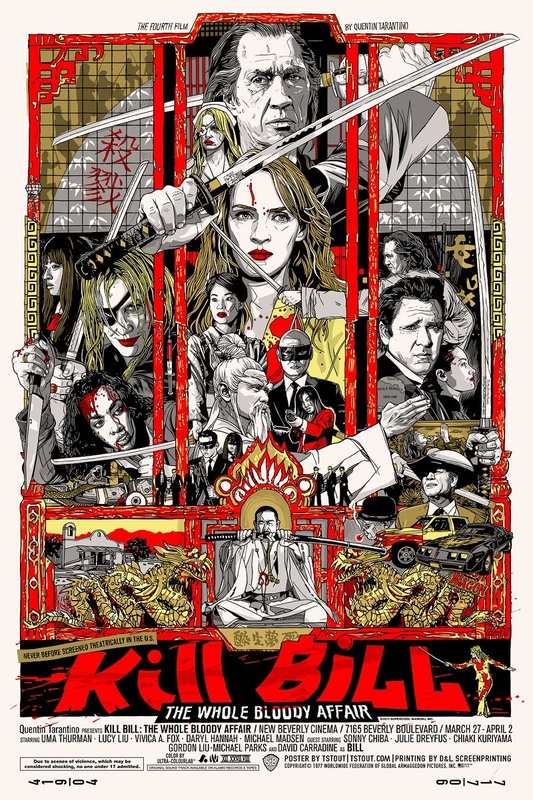 Another great by Tarantino, this time doing his version of a kung fu/revenge movie. The direction is spectacular as is normal for a Tarantino movie, and thankfully they combined both movies into one, ironically, the combination is the movie's biggest problem. The movie is just over 4 hours long, and the second half is 75% talking. The first half focuses more on action and backstory, but the second half slams on the brakes and goes to a crawl. Now granted, the talking is important, and does explain character's actions and personalities, but the two halves are night and day in that regard. The finale is over 40 minutes long, and all talking, it just doesn't feel like a Tarantino movie by the time the credits role. The movie didn't bore me though, it's just 30 minutes longer than it should be, in my opinion. The action's cheesy but also awesome, and Uma Thurman is great, the biggest negative is that the ending is a little too long.